Prepaid Cards for Teens: Tool or Trap? It's easy to see the appeal of prepaid debit cards for people with teenage children. They make it possible to track spending, can be used anywhere, are safer than cash and teens can only spend what's on the card. What's more, the cards, some decked out with images of celebrities, cartoon characters or video game stars, have a certain "cool factor." But according to Lori Mackey, author of Money Mama & The Three Little Pigs, the handy cards have a darker side: "Peel back the marketing messages though, and it seems the credit card companies have found another way to reach our youth with plastic," she argues. "Prepaid cards are the gateway to credit cards." Prepaid cards targeted to teens are under the microscope, particularly after the brouhaha late last year over the Kardashian Kard, which had a $99.95 annual fee and $7.95 monthly fee before it disappeared from the market. Part of the scrutiny comes from the exploding popularity of the prepaid market. The total dollar amount loaded onto prepaid cards will reach $672 billion by 2013, which is more than double what was loaded in 2009, according to research from Mercator Advisory Group's prepaid market forecast for 2010-2013. There's a reason the market is growing so rapidly. "Think of prepaid credit cards as training wheels in the world of credit. They are best for teaching teens to control spending and the conveniences of how and where to use a credit card, without the risk of falling into debt," says Nicole Mustard, senior vice president of strategy at Credit Karma. 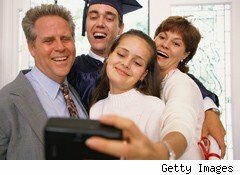 Then, too "There is no more handing out cash that can be lost and difficult to account for by the teen and the parent who can easily forget how much money has been forked over," says Jim Collas, president of BillMyParents, which offers a reloadable prepaid MasterCard (MA) for 13-18 year-olds. The father of four, with two teenagers says, "I've found that my teens now understand how to live within their means and that they are accountable for their expenses. They are on a monthly allowance, so it helps them be aware of how much they have to reserve to make it through the month," he adds. Bob Gutermuth's 21 year-old son has been using a prepaid card since he was 16. "It's been positive because it allowed me to cut him off financially as a device for grounding him (easy as a click), allowed me to funnel emergency money to him when needed, and family members could give him money directly into his card, rather than gifts that he didn't want." Prepaid cards have also worked for Sally Treadwell and her family. "The hope is that kids will associate plastic with considering how much money they can actually afford to spend. I start them with a smaller amount and then raise it to cover other needs (like a gas allowance for the older child), once they show me they can spend intelligently," says Treadwell. Each month the money for their allowance is automatically deducted from her Visa card and that card is automatically paid from her checking account at no charge. Katherine Mulhearn, a spokesperson for Visa (V) says Visa Buxx cards are designed as tools for parents to teach their teens about financial responsibility. Without question, a prepaid card can be just that, especially "If parents start talking about the limitations of credit and debit cards. Discuss what happens if you don't make a payment, and it's also not too early to talk about credit scores. It's only a money management tool if there's ongoing conversation," says Katherine Liola, an Ameriprise financial advisor. Regularly reviewing statements to track and discuss purchases is also a good idea. But, even the best intended use can go awry. "There's a psychological numbing that occurs with the use of cards. It's much easier to spend unconsciously with the swipe of a card, whether it is credit, debit or prepaid. Laying down cold hard cash tends to make us think through our purchases," points out Brad Klontz, a financial psychologist and author, Mind Over Money: Overcoming The Money Disorders that Threaten Our Financial Health. The major problem with cards is that they're similar to chips at the casino, says H. Jude Boudreaux, a certified financial planner with Upperline Financial Planning. "It doesn't feel like you're spending money, just swiping and signing your name. Cash is a much better tool to teach teens about using money." Kim McGrigg, a spokesperson for Money Management International, worries that because prepaid cards look like credit cards, teens might get a comfort level with using credit and not respect the potential for financial ruin if or when they switch to a traditional credit card. And for all the hopefully teachable moments that might arise, the biggest drawback of a prepaid card is that the card activity isn't reported to the major credit bureaus, so they don't help young people establish and build their credit. "For teenagers, building credit is one of the most important financial steps they can take in their young lives, and the sooner they start building a credit history, the better," says Mustard. She believes a secured credit card is a better teaching tool for teens because they learn how to use and build credit. Another problem is the huge matter of fees. "We have seen that these can be dangerous fee-harvesting products attached to clever marketing gimmicks and celebrity names. Pay very close attention to the numbers," says Bruce McClary, a financial educator with ClearPoint Credit Counseling Solutions. "What are the costs of using and owning these cards? There is no benefit to your credit score or credit history, so what do you hope to gain from using these products?" Costs for specific fees vary from company to company, but the cards commonly carry fees for activation, loading (to add more cash), monthly (for the ability to use it), and inactivity (not using it), says Alex Matjanec, co-founder of MyBankTracker.com. For example, BillMyParents charges a monthly membership fee of $3.95 and tacks on another $0.75 to load funds. According to Collas, he's much cheaper than the norm, where a one-time activation fee can be $19.95, and the card carries monthly membership fees of $9.95, load funds fees of $4.95, $25 overdraft fees, $1 signature purchase fees, $1 PIN-based purchase fees and $2 charges for ATM transactions. In other words, the financial education your teen gets may not come cheap. Quite frankly, says McGrigg, "There are a lot of ways to teach kids about money. How about a good old-fashioned checking account?"